This gas dryer has an impressive 7.0 cubic feet capacity, yet still manages to dry an average size load in less than 30 minutes. 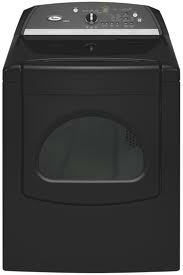 Save time and effort when doing your laundry with the Whirlpool Cabrio WGD6400SB 29" Front Load Gas Dryer. Other features present further increase convenience and ease when it comes to drying garments. All cycles are automatically monitored and adjusted by the AcclerCare Drying system. This feature allows the dryer to sense how quickly clothes are drying and when the load is completely dry. This dryer can also automatically determine the right temperature for each load. Cycles immediately end once an entire load is dry. This prevents overdrying, damage, and shrinkage. You also save time, effort, and energy consumption. You have seven automatic cycles to choose from, including Quick Dry and Delicate. Five temperature settings further expand your drying options. Unload your dryer at your earliest convenience, thanks to the Wrinkle Shield Plus feature. You can delay unloading your dryer for up to 90 minutes after a cycle is finished. Wrinkles are kept from forming by intermittent tumbling of clothes. A lint screen collects lint and fuzz and prevents it from getting all over your garments. An interior drum light keeps the inside of your dryer illuminated during loading and unloading. A pleasing look comes from the porcelain top and sleek black finish. Leveling legs allow you to set up your dryer on uneven surfaces and prevent wobbling during operation. A see-through, reversible door is there for simpler loading and unloading. Rear digital controls and an easy to read LED display make operating this dryer a no-brainer. A variable end of cycle signal alerts you to the state of your laundry instantly. Customers find this appliance energy-efficient. The adjustable temperature is a plus for many buyers. This dryer gets clothes dry quickly and thoroughly. It's a good dryer for the average household's everyday drying needs. This is easy to program and use, with a quick push of a button. It can dry clothes quickly. It has multiple options for different types of laundry. It has a large capacity that can accommodate more loads in one go. Whirlpool has already discontinued this model. Although it is still available from some retailers, no more information is available from Whirlpool's official website. It may also be difficult to get service and support for this dryer. Many customers find this dryer too noisy, despite the noise reduction feature. Even after repairs or replacing parts, customers are still dissatisfied with this dryer's noise output. No steam cycles are present to further enhance drying and wrinkle removal. Clothes come out wrinkled after drying. They also have a tendency to get tangled with each other.